An old-time director reminiscing about his bygone career makes a fine nostalgic read. Yet Ed Wood as the sublime exception, bio-pics about real-life filmmakers have been dramatic duds, from the woeful 1957 The Buster Keaton Story, featuring Donald O'Connor, to the gaseous Robert Downey, Jr.-starring 1992 Chaplin. At recent international film festivals, I've encountered new bio-pics spotlighting the lives of Nanook of the North's Robert Flaherty and Zero de Conduit's Jean Vigo. More losers. 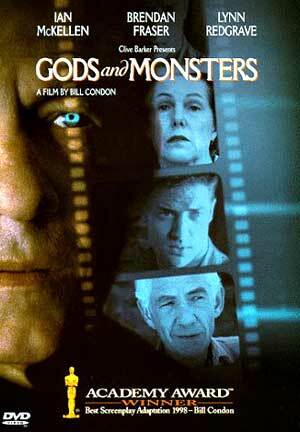 Bill Condon's Gods and Monsters tries again, a screen bio of James Whale (b.1896), a lumpen, crudely educated British lad who, arrived in Hollywood, succeeded brilliantly as the elegant filmmaker of the original Frankenstein (1931) and The Bride of Frankenstein (1935). Whale's the one who ingeniously cast Boris Karloff as Dr.Frankenstein's unfortunate creation, and froze that gentlemanly actor forever in the world's mind as The Monster. Whale's stylish resume also included The Old Dark House (1932), The Invisible Man (1933), and Show Boat (1936). But in the early 40s, his career halted abruptly. In 1957, he was discovered dead, Sunset Boulevard fashion, in his California swimming pool. One thing known certainly about Whale: he was flamboyantly homosexual in the severely closeted 1930s Hollywood, and he lived openly there for many years with producer David Lewis. Although his last couple of films were box-office disasters, and might have factored into his dismissal, Whale was probably a Hollywood firing because of his unhidden gayness. At least that's what film historians surmise, such as The Celluloid Closet's Vito Russo. As for his death, nobody knows much. He might just have died swimming, or maybe Whale was a suicide because his then-forgotten career. Or were there "other factors"? Gods and Monsters tries to fill in those last days, basing its speculations on Christopher Bram's novel, Father of Frankenstein. We are given Whale ( a white-haired, dandyish Ian McKlellan) at home, waited on hand-and-foot by his religious servant (an ever-flustered Lynn Redgrave). Suddenly, he becomes enamored of his new yard man (George of the Jungle's Brendan Fraser, awkward as a Lady Chatterly's Lover-like object of desire). Whale would love to bed down his muscle-bound employee, but young Clayton assures the horny old man that he's straight. So instead, they talk. And talk. And talk. And the James Whale of this movie proves to be a dotty bore. Enough already of those self-pitying stories about his unfortunate childhood, about his lover lost in the Great War, about his jealousy against Hollywood's establishment gay director, George Cukor! Filmmaker Condon reinforces Whale's tiresome complaints with lugubrious flashbacks to post-Dickensian England and to the trenches in World War I. As for Cukor, Condon invents an unpersuasive Hollywood party where a semi-gate crasher Whale dishes his director arch-enemy. And Whale's Hollywood horror hits? Gods and Monsters goes along with the perhaps too-cozy Freudian line that the director's Otherness came out in his freaky, condemned, bruised creatures. Condon cuts quite obviously between scenes from the Frankenstein pictures, where Karloff cries out to be loved, and poor, forlorn James Whale. However, there is one great sequence in Gods and Monsters: a recreation of the Universal Pictures 1935 shooting of The Bride of Frankenstein. We see a portion of the filming of the immortal scene where an adult female is created for the Monster and where, coming to consciousness, she shrieks with abhorrence when she actually sees her would-be husband. Filmdom's all-time most potent Castrating Glance! Condon gets his day on the set just right, with his modern-day actors as the perfect broken-mirror counterparts of that wonderfully loopy original cast. As Condon also demonstrates, James Whale must have been in queer heaven on The Bride of Frankenstein, with Elsa Lanchester, wife of gay actor Charles Laughton, as the reluctant bride, and Dr. Frankenstein and Dr. Praetorius played, respectively, by Colin Clive and Ernest Thesiger, two of his homosexual pals.